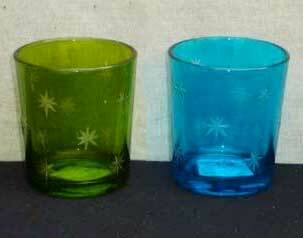 We offer a supreme range of Engraved and Painted Glass Votives to the clients all over the world. These Engraved and painted glass votives are manufactured from optimum quality glass, for fine finish and durable life. Our cost effective range of Engraved and painted glass votives is available in vibrant colors as per the requirements of the clients.